Check out our Idle Apocalypse guide, tips, cheats & strategy to progress fast. Idle Apocalypse is a brand new Idle game for Android by Iron Horse Games LLC in which you build the army of goblins, beasts like creatures to destroy the whole world. Since it’s a unique game, it could be difficult for beginners to understand the basic aspects of the game. Let’s start with the basics first. In Idle Apocalypse, you build floors and at each floor, you produce resources with the help of creatures. In addition to the resources, these creatures also drop dark energy. Dark energy is needed to summon Idols. You can summon Idols by building the Idol Portal. For the first time, you will summon Larth, then Morag, Gurth, Rick, and more. All these Idols will help you in destroying the world or in starting the Apocalypse. For the first time, you will have to start the Apocalypse to build the Kitchen as it requires Mighty Hammer. When you start the Apocalypse, you will have to tap the screen continuously. Depending on the Idol’s damage power, taps, you will earn souls. Once done, the game will send you back to the 0 floor(you will start from the beginning, but with souls). On 0 number floor, you will see the option to spend souls. As mentioned above, you produce a wide range of resources in the game and these resources are required in building, upgrading. First, understand the floor’s mechanics. On the right side of the screen, use the navigation buttons to move or explore. There are two upgrades on each floor: creature upgrade and floor upgrade. To upgrade, you need a set amount of resources, mentioned near the gear icon. Upgrade the creature to improve the production amount. Upgrade the floor to unlock new items or creatures. But keep in mind that you can produce only one resource item at a time on a floor. Tap the pause button to stop, tap the play button to start. Depending on the resources requirement, you will pause and start. Tap the item to know its source of production. Build more floors to progress. On some floors such as Library, archives, Dark Altar, you can activate boosters. For example; At the dark altar, you can unlock and upgrade passive buffs for the Idols. In Library, you can activate boosters to improve the production speed, item drop rate, damage power of creatures, and more. On the main screen of the game, at the top-left corner, tap the battle button to visit the battle screen. By defeating the enemies or monsters or monster champions, you can obtain valuable items(Coin, crown, Goblet, necklace, and more), required in the building, researching, and upgrading. Head to the Generator I floor and charge it to increase the creature spawn time. Upgrade the floors to unlock more creatures, plant creatures, undead, and more. You will unlock more generators as you build more floors or progress. For example; Generator I increases the creature spawn time. Generator II increases dark energy drop rate. And Generator III boosts the production of resources; Mine, Arbitrarium, and more. To keep them in running state, you will have to tap on them(to charge). Do it often. First, you need to build the Idol Portal. Summon the Idol. Once summoned, go to the 0 Number floor. Tap the start Apocalypse button and tap the blast button. Tap more and more to damage more. Prior to it, you can check how many souls you will get after the apocalypse. After Apocalypse, you will start the game from scratch. You will lose all the floors, items except diamonds, wheel token, souls, and permanent upgrades. Head to the 0 number floor again and tap the button; spend souls. You can spend souls on buying temporary upgrades as well as permanent upgrades. 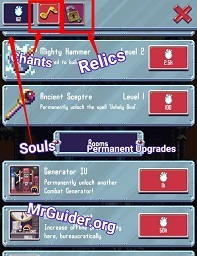 After tapping the button, on the next screen, you will see the relics(permanent items), rooms, creature skins. Purchase the required item or unlock the room(permanently) using souls. You can also spend the souls in buying chants. Head to the first tab on the same screen by tapping the chant button. There you can buy temporary boosters(not recommended). Idols help you in earning souls(when you start the apocalypse). Depending on the damage(in the apocalypse), you earn souls. 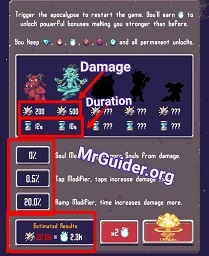 You can increase the damage power of Idols on their floors, using the resources. And by researching! At spell factory, you can upgrade the spells. You use these spells in defeating the monsters in the battle. Research in the library to increase the spell power. On the main screen, at the top, tap the bag icon to check the items stored in the tower. Tap the floor number on the right side of the screen to open floor menu. There you can check the progress: Out of order, floor name, and more. Tap the gear icon on that screen to modify or rearrange the floors. Idle APOCALYPSE – HOW TO PROGRESS WISELY! In order to unlock the rooms permanently or buy the HR Department room(it increases the offline income), you need souls. And to obtain the souls, you need powerful Idols. So focus on their upgrades. Make them stronger to obtain more souls from the apocalypse. First, set your objective and work accordingly: for example; you want to build juicer. To build juicer, you need mechanics. And to build mechanics, you need Vines(start producing Vines in Arbitrarium), metal(start producing metal in the factory). To produce metal at the factory, you need Dullium Ore(produced in mine). Focus on one objective at a time! 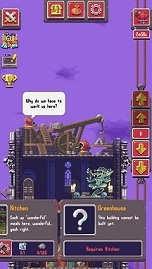 Idle Apocalypse is an Idle game for mobile devices. And this one is very unique in comparison to all other Idle Games like The AdVenture Capitalist, Idle Miner Tycoon, Idle Factory Tycoon, Wild Wild Saga, and more. In most of the games, you create a party of heroes and save the world. But in Idle Apocalypse, you have to do the opposite. In this game, your objective is to destroy the world. And to accomplish this task, you need a strong powerful army of demons, goblins, and other creatures. The concept of this game is pretty simple; In this post, we have covered everything about the game you need to know: Idle Apocalypse guide, tips, cheats & strategy. Before we dive in to the cheats, tips & strategy part, let’s learn the basic guide first which is very important. In Idle Apocalypse, your main objective is to destroy the world. To destroy the world, you need to summon a demon. And to summon the demon, you have to build your tower, set up an army of goblins and gather dark energy. The dark energy is required to summon the demon. For instance, for the first time, in Idle Apocalypse game, using 1 million dark energy, you can summon Larth(Demon). Once summoned, you can start apocalypse and earn souls. Souls are used in unlocking boosters and for the first time, you obtain hammer. Hammer is required to build the kitchen. And the kitchen is required to unlock the greenhouse. Greenhouse? At greenhouse, you can obtain wood material. Wood is required to upgrade the mud farm and upgrading mud farm unlocks new goblin or a creature “Ogre”. And this new creature deals more damage to the enemies. Did not get it? Just read the complete post and you are good to go! Let’s start the Idle Apocalypse guide and after it, check out the Idle Apocalypse cheats, tips & strategy to destroy the world. In this part, we will learn about everything; how to play Idle Apocalypse, about buildings, goblins, creatures, demons, enemies, material, souls, apocalypse, and much more. If you already know how to play, then skip this part and move to next part. For those who are unfamiliar with this game; In this game, your task is to build the tower; in the tower, you can build many buildings. For example; Mud Farm is the main building in this game. At mud farm, you produce goblins. Your first creature/goblin is Gremlin. Mud Farm produces this creature free without any material. They will go to the battle and defeat enemies. Enemies can also defeat these goblins. Each goblin drops a specific material in the battle. For instance, Gremlin drops slime material. And this material is used at hatchery building to produce beasts. These beasts also contribute to the battle and drop a specific material. And this material used by another building to produce another material. And this process continues. You can tap on the building icon to know more about it. Tap on the creature to check its stats; damage points, drop rate, and more. And tap on the material which is required to produce a specific beast or goblin. Complete the order and the building will automatically start producing it. Well, it’s not easy to destroy the world. But our Idle Apocalypse guide, tips. cheats & strategy will make it easy for you to destroy the world in short span of time. Let’s start the real Idle Apocalypse guide and uncover everything! In Idle Apocalypse, to build the powerful army of demons & goblins || creatures, you have to build the buildings. At the right side of the screen, use the navigation keys, go to the top of the tower and you will see the buildings you can unlock there. Go at the bottom and check the buildings you can unlock. The main building is mud farm. Because this building produces goblins and goblins go to the battle and drop the material. You use this material to unlock new buildings or to produce a beast or spell or for other purposes. Arbitarium, produce roots, vines, and much more. You can upgrade the production side & the building. Just tap on the gear icon and confirm. Upgrading a production side improves the performance. For instance, upgrade a goblin to obtain more rewards, increase the deal damage. Upgrading a building unlocks a new item or creature. For instance, if you want to unlock a new beast, upgrade hatchery. If you want to unlock a new goblin, upgrade mud farm. For a new magic spell, upgrade magic workshop. Upgrading is one of the important tasks in Idle Apocalypse game. So, make sure to maintain the upgrades. The soul is one of the precious items in Idle Apocalypse game. Using souls, you can unlock premium boosters and progress fast. To obtain souls; unlock Idle portal, summon a demon. Go to the dungeon -> Start Apocalypse -> confirm. 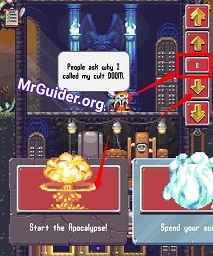 Read the Idle Apocalypse cheats, tips & strategy guide below to destroy the world like a pro! Negative Effect: – If you destroy the world or start the apocalypse, you will have to start the game from the beginning. Positive effect -> You will get souls and you can spend these souls in unlocking premium boosters. And it’s very powerful and you should do it at the right time to get more benefit. So, this is the basic Idle Apocalypse guide for the beginners. Now, let’s start the Idle Apocalypse cheats, tips & strategy. In Idle Apocalypse, there are many buildings and at each building, you can produce only 1 specific item at a time. Your task is to maintain the chain of this item line and manage it to balance the output. For instance, the cracked orb is an item dropped by a goblin(Orc Mage). This item used at the magic workshop to produce tome book and in constructing new buildings. If you use entire quantity in constructing new buildings, then you can not produce tome book at the magic workshop. And if you stop producing the tome book, then other buildings where tome book is used will also stop working. Summary – In Idle Apocalypse, each item is linked with multiple buildings. You have to use it wisely otherwise you can not progress fast. Quick Cheat -> Produce & Pause. If you have a specific material in bulk quantity, then pause its production and start producing rival one. If there is a shortage, pause the current one and start producing it. In short, balance the production. This side gets unlocked once you unlock a certain number of buildings at your tower. Here you get free offers. Watch the video ad and claim free rewards. At the beginning of the game, you have one generator. Keep it active to get the advantage; just tap on it and enjoy the advantage. Unlock new generator to get another booster; i.e. dark energy. Dark Energy is required to summon a demon. You can increase the dark energy production by upgrading goblins, beasts, unlocking generator and at the library, by unlocking the boosters. Go to the bottom of the tower and check the resources requirements required to unlock idle portal. Unlock Idle portal and summon the demon. After summoning, go to the dungeon and start the apocalypse. Check the number of souls, modifiers rate and start. On the next time, start it wisely. For instance, for the first time, you got 500 souls. Next time, it should be 1K, then 5K, 10K, and so on. At the top left of the screen, tap on the TV icon and watch the video ad to get free boosters. Offline Earnings -> Open the game with an active internet connection and claim your offline earnings. Keep note that you can claim offline earnings once in a day; so, claim it at the right time(after a huge gap). So, these are some basic Idle Apocalypse cheats, tips & a strategy guide for the beginners. Also, see – Best Idle games for Android.